What would a Bible Study website be without a discount Bible book store, right? Thanks for coming into the store today. I love God's word, and I know you do, too. God's word, found in the Holy Scriptures, is our #1 way to hear from God. He intimately speaks to us personally through his Bible. People need to hear from God today in the worst way. The world's people are hurting. It's no great leap of logic to conclude that purchasing a Bible for yourself or as a gift is a wise choice. After all, God gave us his word as a gift, so why not pass God's gift on to someone else? Giving a Bible is literally opening the lines of communication between God and the one fortunate enough to receive his word. There are so many different Bible translations, and they come in all shapes, colors, and sizes. All of the Bibles have different options, study helps, and formats. You're probably crying out, "Which Bible version do I choose?!" Haha! Great question. Let me try and help you discern the best to buy. 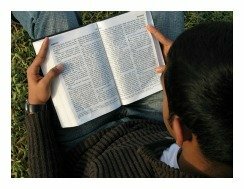 Here are a few Bible buying tips. For who am I purchasing the Bible? And, What gender and age is the person? If the person is over 40 years of age go with a larger print, but not necessarily the largest print. There are also childrens' Bibles, womens' Bibles, mens' Bibles, etc. You can always ask them first, too. For what purpose will the person use the Bible? Answering this question helps you discern which version and style to buy. Buy a modern version such as the NLT (my personal fave) or NIV translations for devotional type reading of the Scriptures. But, if a serious student of the Bible is your recipient then consider the KJV, ESV, NKJV, or NASB versions. Again, it never hurts to ask the recipient what they want/need. Keep this in mind, too: Classic black, genuine leather is always a great choice for men and women. Be sure to use the Bible book stores' wrapping and drop-shipping services, making your gift-giving experience perfectly enjoyable for you and your recipient. Final note: Take your time browsing. Most of these sites have excellent deals in a separate section - don't miss them! As always, you're invited to click on the banners and links below, which take you directly to the store. Happy Bible Shopping! I know you'll be blessed. This non-profit organization runs a very nice discount Bible book store. They've been engaging people around the world with the gospel for nearly 200 years. Support their mission while you support those you love with a brand new copy of the Bible from American Bible Society. ABS has all major Bible versions in stock and ready to ship immediately. Make sure to find their specialty Bible section, too, which offers many gift Bible formats and styles. Biblica Direct, formerly known as the International Bible Society, handles all of the most popular versions of the Bible: NKJV, KJV, NIV, NLT. This is a top-notched store which will delight you with countless cover styles. I especially like both the Outreach and Soldier's Bibles. They have tons of Children's Bibles, which of course make outstanding, eternal gifts to the young children God has placed in your life. Click on the link for Bible browsing and purchasing. Celebrate the birth of our Lord with a new Bible from BiblicaDirect.com ? CLICK HERE! ChristianBooks is a proven online giant when it comes to discount Bibles and books. They basically have anything and everything imaginable when it comes to Bibles. Click on the following link for great deals. Share on Facebook below and click for more our Bible Book Store. Special Note: I'm grateful to Big Book Media & Free Bible Images, stock.xchng, Morgue Files, and Stock Photos For Free for the use of their photos for Bible Book Store.